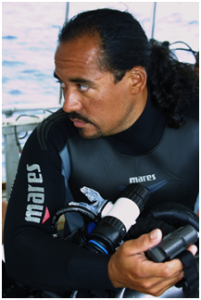 Tech Diver / Content Producer / Shark Behaviorist. David Ulloa is the president and owner of Valeo Films Inc. (VFI), an independent film and video production company, and the Co-Founder of Trident Global Imaging, LLC.David’s passion for his film and video production work and his performance as an Camera Operator, AD, UPM, Line Producer, Writer, Director and Producer have earned him the respect of his colleagues as well as the industry at large. In addition to his company’s professional activities, David regularly participates in numerous film related events and festivals. 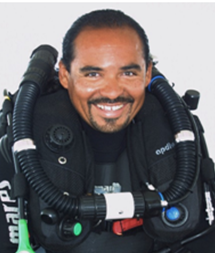 David is also very enthusiastic about speaking at conventions, museums, schools, universities, group meetings and dive clubs. Through Trident Global Imaging, David works to develop compelling visual products that speak to mankind’s fundamental need to explore. His expertise lies in his extensive imaging experience, an understanding of the technology required to reliably capture and deliver virtual tours and provide a thorough understanding of the needs of businesses to uniquely engage their customers. Through TGI David is rated by Google as a Trusted Independent Photographer. about our oceans, the creatures within them and the now widely-recognized realization that we must do everything within our power to safeguard them. A fundamental mission of his is to highlight the plight of the most graceful, intelligent and magnificent of all ocean creatures – the shark – and to propose solutions toward their protection and conservation. He is recognized as The Shark Whisperer because of his ability to effectively communicate with sharks using widely recognized large animal behavior techniques. David was featured on “The Quest for Sunken Warships,” a popular series for Discovery Networks’ Military Channel and on the History Channels “MysteryQuest.” David has also been published in several global publications.